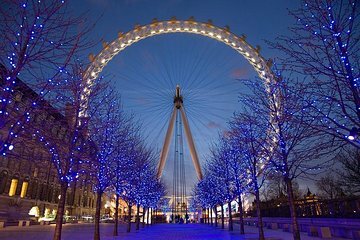 Escape London’s tourist crowds and endless traffic jams and experience the city at its best on a Christmas Day tour by vintage bus. Cruise past the English capital’s legendary landmarks while listening to entertaining audio commentary; sail through the traffic-free streets and enjoy unrivaled views of Big Ben, Westminster Abbey, and the Houses of Parliament as you discover the city on a vintage red double-decker bus. Stop for photo opportunities outside the Tower of London and the London Eye and capture excellent shots without the usual hordes of tourists. Depart from your selected central London hotel and climb aboard your distinctive double-decker bus to embark on a magical tour of the capital. Relish the lack of cars or people on the streets as you drive past some of the city’s most impressive monuments; see the architectural delights of Big Ben, the Houses of Parliament and the London Eye and then disembark the bus to capture fantastic photographs beside St Paul’s Cathedral. Hailed at Sir Christopher Wren’s masterpiece, the iconic white dome of the sacred structure proves an impressive backdrop to your photographs. Hear of the commemorative monuments the cathedral contains from your guide and then return to the bus for the drive to the foreboding Tower of London. On arrival, snap photographs of the ancient building and gain fascinating insight into the mysteries and legends surrounding the landmark; hear of its different functions; find out why distinctive Beefeater guards protect it; and listen to descriptions of the precious Crown Jewels. After your incredible tour, return to your hotel to continue enjoying the magic of Christmas Day. Please note that this is an open top bus tour - please be prepared for the possibility of rain. In adverse weather conditions a closed top bus may be used.